A great resource for fashion and creative professionals is Trendstop.com an online fashion and trend forecasting agency based in London. They have an extensive data for forecasts and trends in all areas of clothing, accessories and beauty for Mens and Womens. 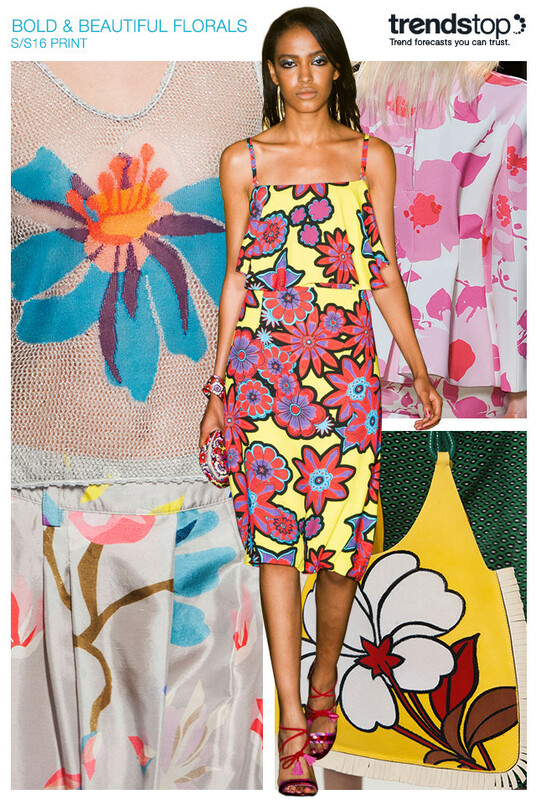 Here is a key Women's Print and Floral Patterns for the SS 2016 season. 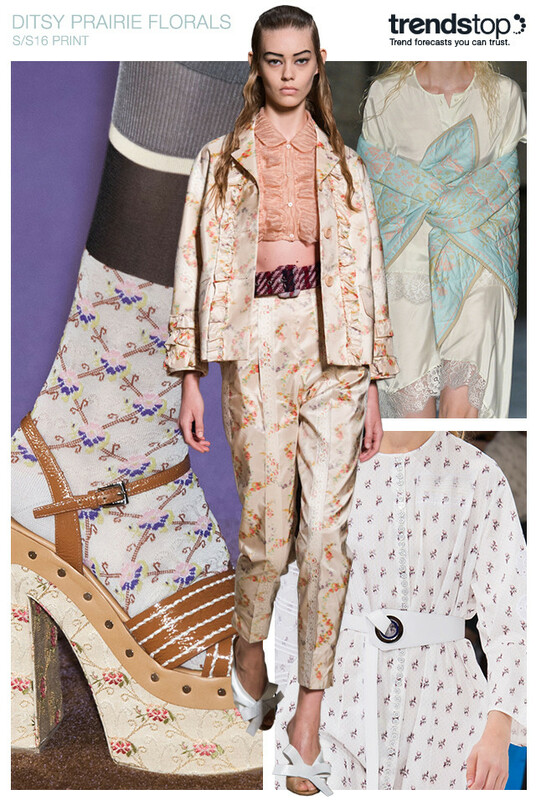 Go to our Trendstop shop here to order your copy and view their other SS 2016 trend reports. 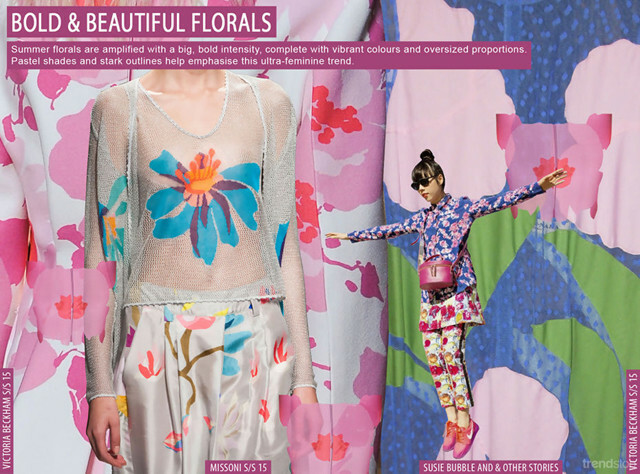 The Trendstop experts have compiled the most inspirational best-selling prints for the upcoming Spring/Summer season. Discover how leading designers are utilizing new prints in our S/S 2016 Print & Embellishment Forecast. 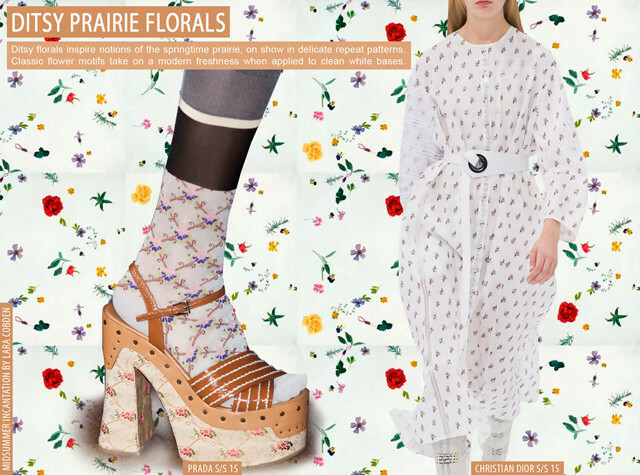 Here, an excerpt, are two must-have floral print styles for Spring/Summer 2016: Bold & Beautiful Florals and Ditsy Prairie Florals. A playful attitude emerges for spring, as florals are amplified with a big, bold intensity to catch the eye with vibrant colors and oversized proportions. This trend adds a striking statement to womenswear styles. On the catwalks, House of Holland showcases a modern take on a retro floral print with stark black outlines, while clean white bases lend a fresh touch to Victoria Beckham’s abstracted pink blooms. Blown-up placements can also be used, as seen with combinations of painterly petals and sheer knit at Missoni or vivid color pop bases on a Marni bag. House of Holland, Missoni, Marni, Victoria Beckham, all Spring/Summer 2015. Ditsy florals inspire notions of the springtime prairie, on show in delicate repeat patterns. Classic flower motifs take on a modern freshness when applied to clean white bases. Miu Miu applies the delicate print to a chic ivory-based summer suiting ensemble, as feminine prairie dresses incorporate classic repeats at Christian Dior. Meanwhile, contemporary interpretations appear at Prada in the form of sports blocked socks for contrast, with MM6 Maison Martin Margiela adding texture to a soft pastel pattern with the use of lightweight quilting. Miu Miu, Christian Dior, MM6 Maison Martin Margiela, Prada, all Spring/Summer 2015.